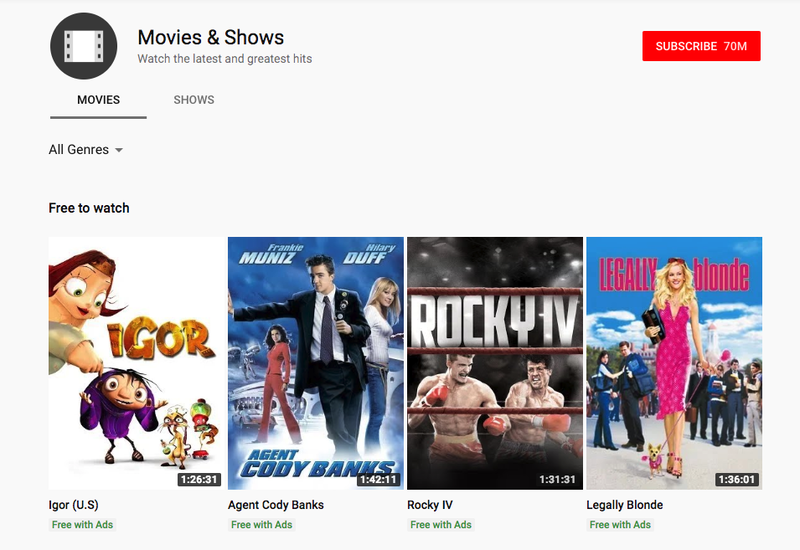 If you’re willing to suffer through a few commercials, YouTube is now offering a number of movies on its site that can be streamed for free. The collection of free films officially launched in October but started getting attention over the past few days. While you won’t find any new releases, there are a few films you might actually want to watch. The collection currently includes Legally Blonde, The Terminator, and several Rocky movies, among others. Films are being made available through partnerships with movie studios, so the collection is subject to change. When you watch one, ads will be shown throughout your viewing, similar to the experience if you were watching the movie on broadcast television. You can check out the full collection of free stuff here. Worth noting, this page is the only place you can see all the free films grouped together. If you try to sort things by genre, you’ll end up with movies you need to pay to rent or buy in the mix as well. And this might only be the beginning of ad-supported feature films on YouTube. Speaking with AdAge, Rohit Dhawan, director of product management at YouTube says that in the future we might see advertisers using the platform to sponsor the viewing of a specific film. For instance, you might have the opportunity to watch a recent release for free if you’re willing to watch a few toilet paper commercials.